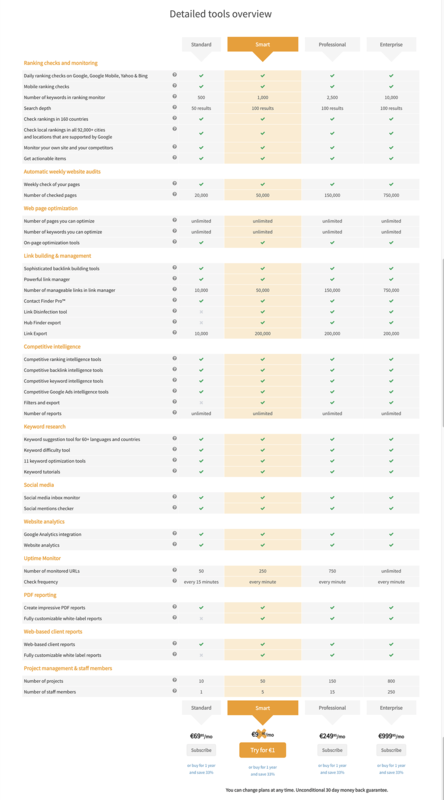 SEO Profiler is the clear winner when it comes to a very good price-performance ratio. 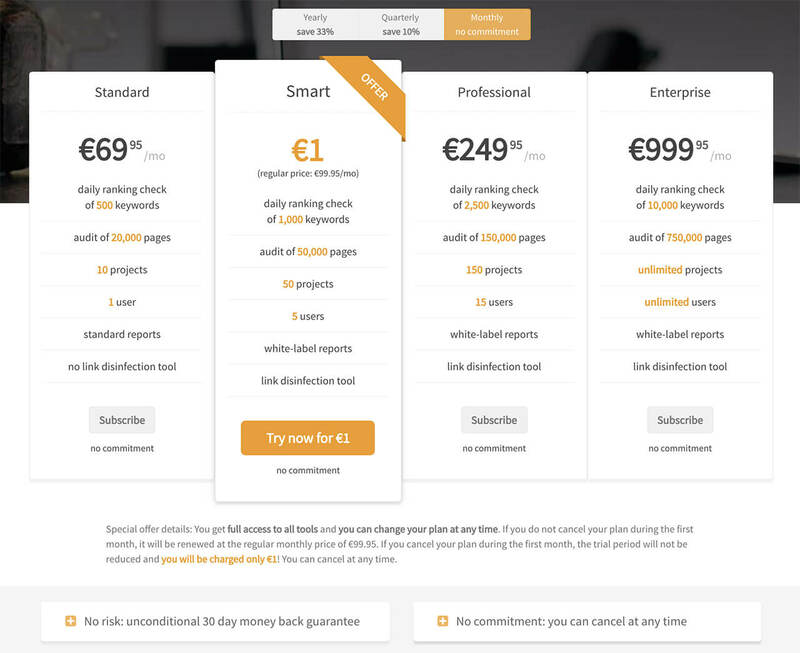 The cheapest paid package already includes 10 projects with full functionality. The numerous tooltips lead beginners step by step through the optimization of a website and the extensive help offers an excellent and holistic entry into the world of search engine optimization. After the first crawl, the potential for improvement is clearly displayed, further you get concrete instructions on how you can improve your ranking. The keyword rankings are updated daily. By starting a new analysis, you can see immediately if your optimizations have been implemented correctly. The free version includes two projects limited in functionality - for only 1 EUR, you can test the PRO version for 30 days without any obligations or restrictions. Professionals and agencies also benefit from the value-for-money advantage of SEO Profiler. While even in the largest paid packages other providers allow only a limited number of projects, an option with UNLIMITED projects is offered here. 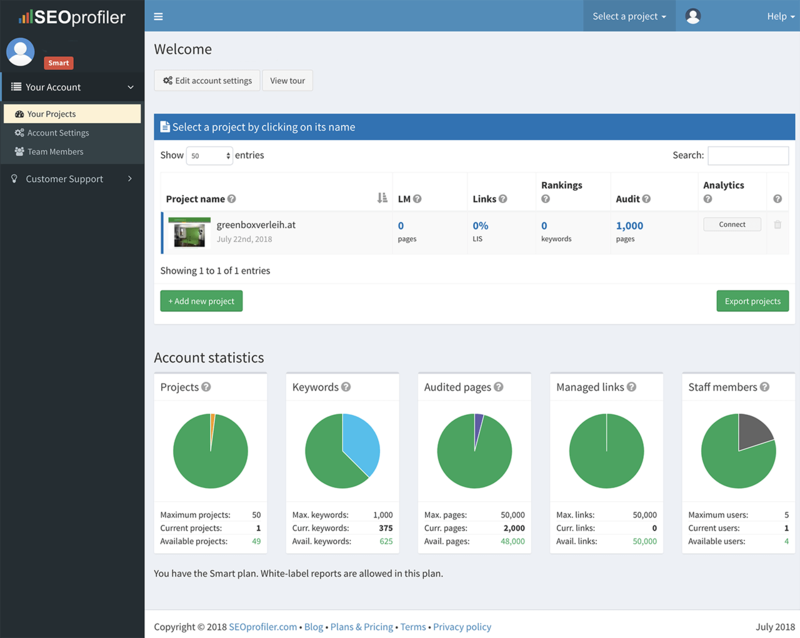 SEO Profiler provides a solid SEO solution, which shines especially with a comfortable reporting (important for white label customer reports). SEO Profiler is the clear price-performance winner in the test and contains all relevant functions for a successful search engine optimization. SEO Profiler offers the best value for money in the test. Depending on the time commitment, savings of 10 - 33% of the price can be achieved. 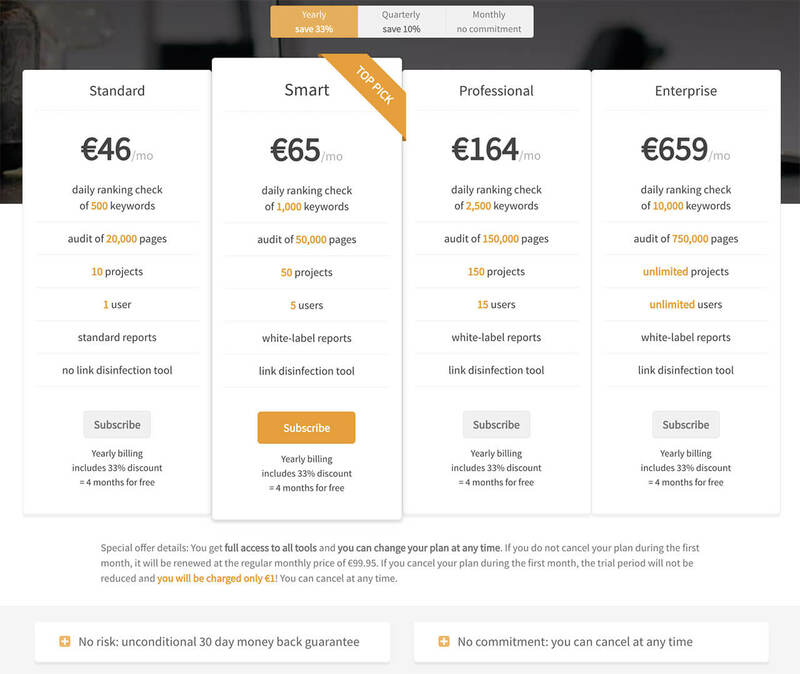 The cheapest package starts at 46 EUR per year. After the payment of the 1 EUR test offer, it may happen that instead of the SMART Edition still the DEMO version is displayed - don't panic - it helps to log out and log in again - then the SMART edition is enabled! As part of the registration process, you will be asked to provide an e-mail address and a password as well as a website domain to be optimized, which will then automatically be examined by SEO PROFILER for errors and possible improvements at the first entry point. Depending on the package booked, you can then create between 10 and 150 projects to be optimized, which makes the service equally interesting for beginners and agencies alike. After logging in, the start screen shows the projects already created. Click on a project to open it. By clicking on the desired project, it will be opened immediately and an overview of the current status will be displayed. On the left side, there is the navigation sorted by category, which are essential for the search engine optimization. If you seem to be killed by information at first glance - don't panic! 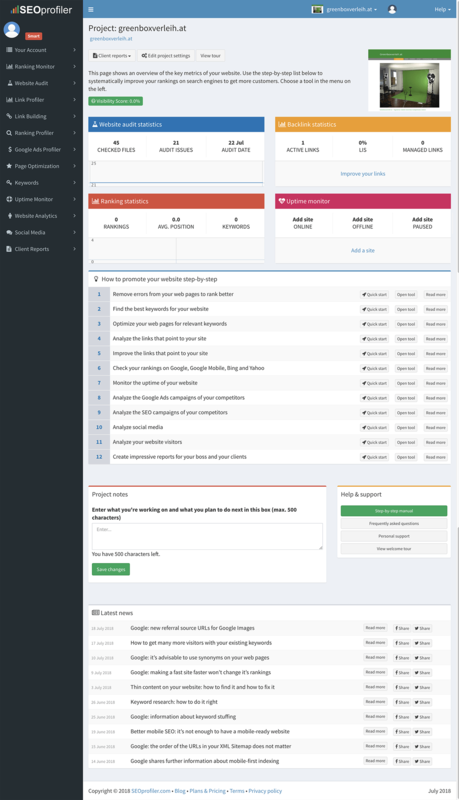 - the clever menu navigation makes everything easier than you initially think. If you scroll down the same page, you will see a step-by-step guide on how to start your optimization, including a lot of information about each step. This guide is helpful in learning how to use the software itself and it brings along the basics of search engine optimization for beginners. This is why SEOProfiler can absolutely be recommended to beginners. In addition, tooltips provide guidance and explanation through the individual steps of optimization - a great help for newcomers to search engine optimization (you can also start by clicking on the START TOUR button under "HELP & CUSTOMER SERVICE". Although the order of the navigation may seem to use the RANKING MONITOR as the the first step, it is not. The RANKING MONITOR is ranked above because -AFTER a successful optimization - it will be the most chosen menu item to query the daily results of the keyword rankings. But more on that later. By clicking WEBSITE AUDIT, a drop-down menu with some menu items will show up. First of all we choose OVERVIEW. If the project has just been created, it may happen that there are no results shown, since the website review may take some time, depending on the size. So just wait until it's done (which can take a few minutes or even up to an hour). You receive an e-mail notification after the check, so you do not have to sit in front of the computer during this time. When the audit is complete, you get a good overview of ERRORS (red - these points MUST be corrected), WARNINGS (orange - these points should be corrected) and NOTES (blue - these points should be remembered). Last but not least, spelling errors are pointed out. 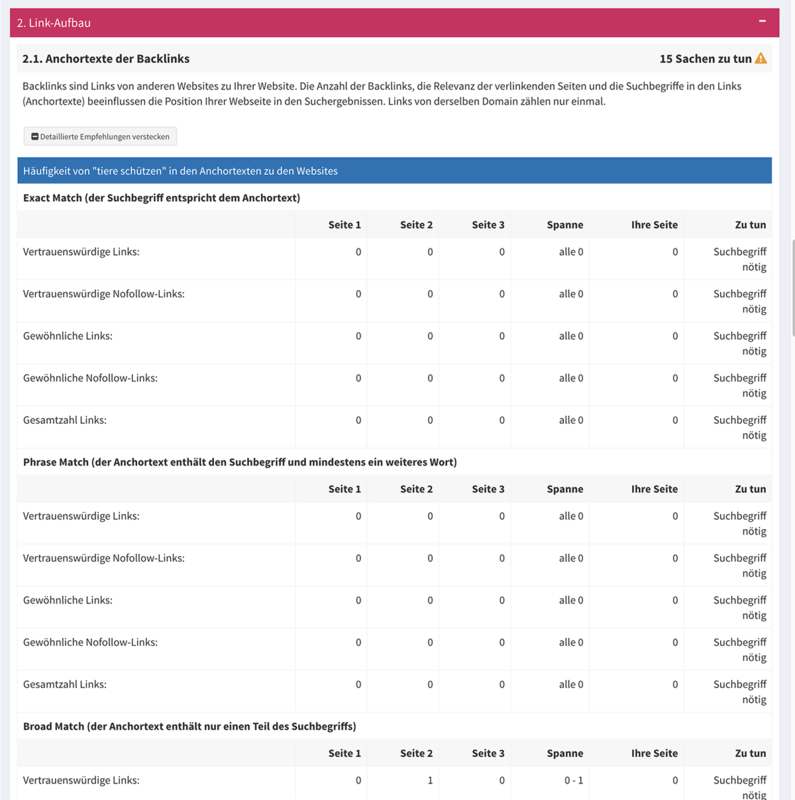 By clicking on the button SHOW PAGES in a line with an error, the number of concrete errors on the affected subpages is displayed. By clicking on the respective subpage, ALL errors will be displayed on this page. In this way, these errors can be corrected quickly and efficiently. The website audit is automatically performed once a week. 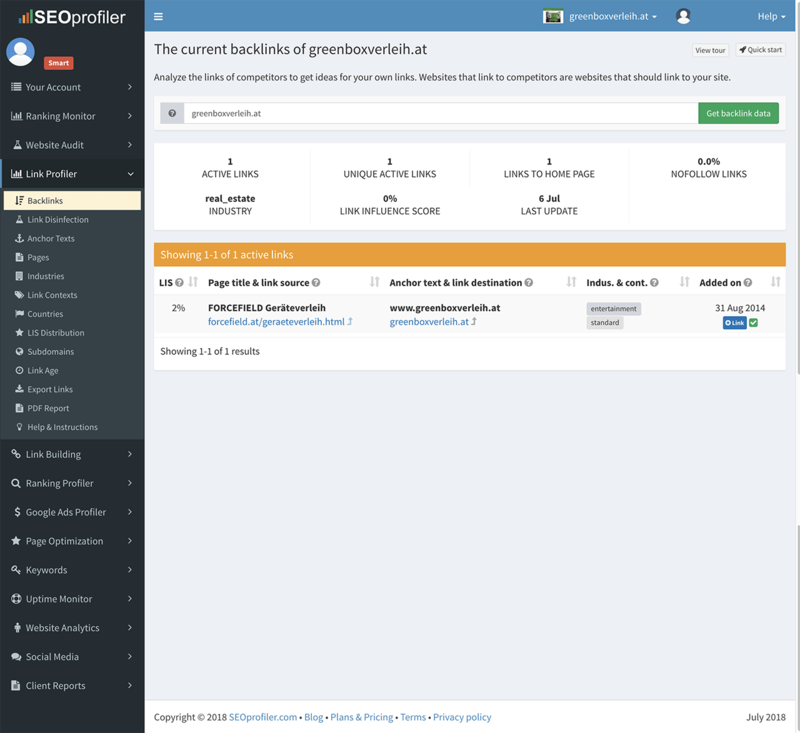 But if you want to know immediately whether your improvements are technically correct, you can start a new website audit by clicking EDIT SETTINGS on the button of the website audit results - at the bottom of the AUDIT SETTINGS page, you can find the button RESTART AUDIT to perform a new audit. If necessary, SEOProfiler can create a sitemap of the web project, which can then be uploaded to Google or Bing Webmaster Tools to help the search engine index the web page. In order to do so, you only have to click on DOWNLOAD SITEMAP FILE and upload the finished file in the respective webmaster tools. Last but not least, the Robots.txt file is analyzed and checked for any errors. In order to stay with onpage optimization, the next step will be PAGE OPTIMIZATION. Once unfolded, we click on the TOP 10 OPTIMIZER. This tool helps to identify all the prerequisites for a top 10 search engine ranking so that they can be implemented quickly and efficiently. In fact, everything works just as well as it sounds. In the first step you enter the webpage (you can also enter URLs of other pages than the homepage) to be optimized as well as the keyword and the search engine for which the website should be optimized. Furthermore, you can choose whether you want to optimize for desktop or mobile websites. In regard to past Google updates that make mobile search results more important than desktop results, you should focus on optimizing your mobile search rankings. Furthermore you can name competing web pages, which can automatically be checked for the entered keyword by clicking "GET HIGH RANKING PAGES". After clicking on CREATE TOP 10 OPTIMIZER REPORT, a report will be created that will describe exactly what your optimization options are and how to implement them. With the implementation of these guidelines, nothing should keep you from a TOP 10 ranking. By clicking on the respective problem, exact details of the problem and proposed To-dos are shown. By completing the previous steps, onpage optimization is largely done. But the SEOProfiler also provides very good tools for offpage optimization. With the Link Profiler, existing links can be checked for number, quality, age and a variety of other features. The value of a link is represented by the Link Influence Score (LIS), with higher percentages representing better link quality. The LINK DISINFECTION tool can be used to remove bad links to your website. LINK BUILDING helps with the difficult topic of creating quality backlinks. 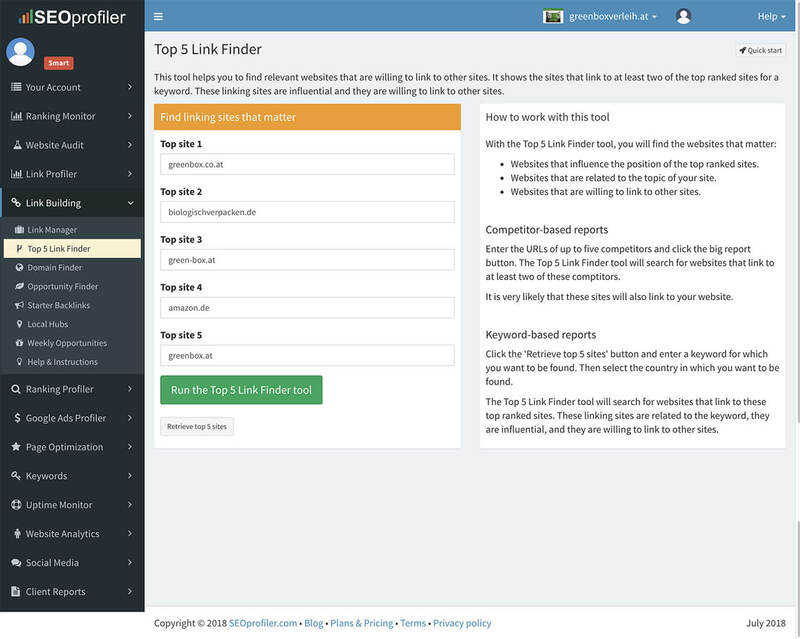 The TOP-5-LINK-FINDER identifies the Top 5 websites for the selected keyword and shows existing links pointing to these websites. If possible, you should also win these links for your own website. Other potential link partners can be identified with the DOMAIN FINDER, which has the chosen keyword in the domain name. The OPPORTUNITY FINDER will display directories, articles, blogs, and forums that can serve as a link source after entering a keyword, and the STARTER BACKLINKS will directly provide numerous link partner opportunities. LOCAL HUBS offers a number of local search engines in which an entry should be made. The direct registration within SEOProfiler is offered. 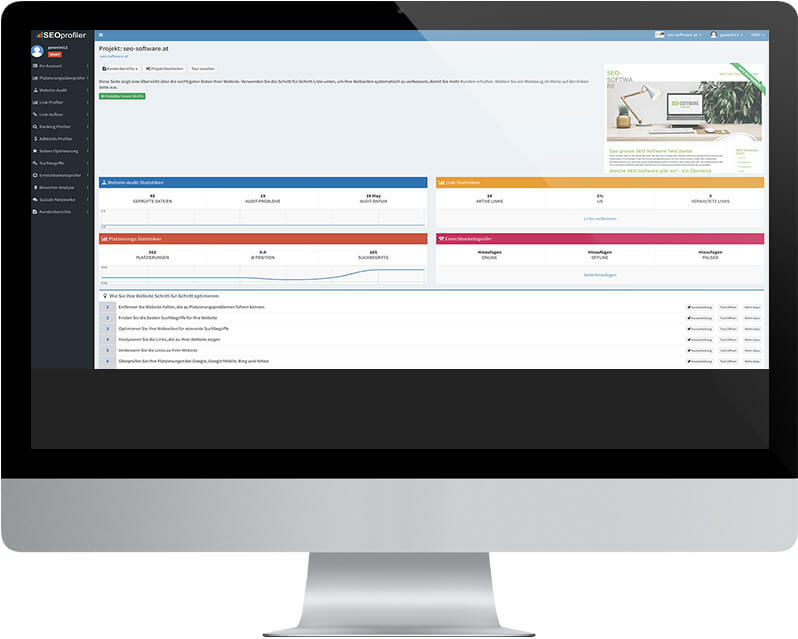 To manage links and link partners you can use the LINK MANAGER tool, whose filter function makes it easy to find a link partner that is currently pending. With the RANKING PROFILER, you can automatically display and monitor visible keywords in the search engine by clicking on the button "ADD THE VISIBLE KEYWORDS BELOW TO THE RANKING MONITOR" under the menu item KEYWORDS in the RANKING PROFILER. 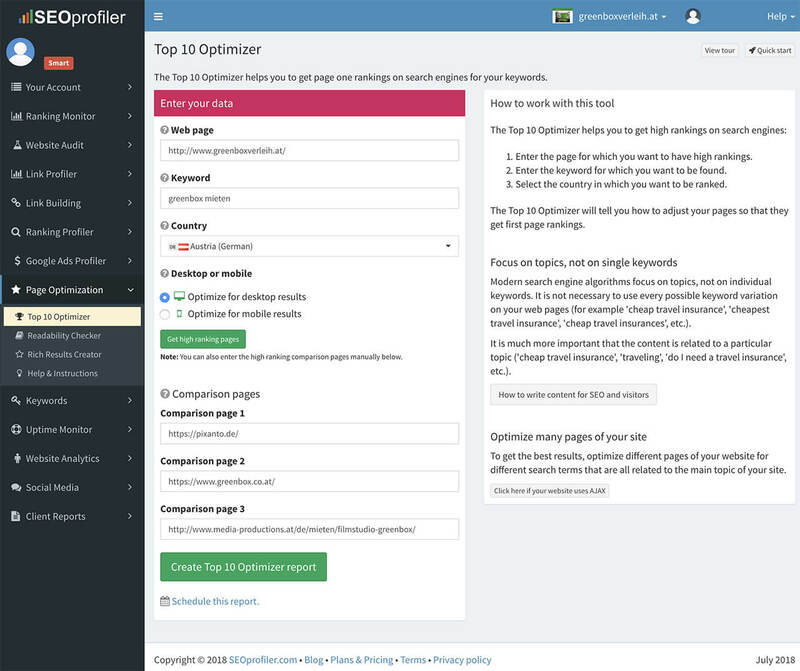 RANKING PROFILER also provides a wealth of information about existing keywords, such as the ranked pages, competitors, countries and subdomains. After completion of the initial optimization, the keywords are checked in the Ranking monitor. The rankings of the individual keywords are updated daily and can therefore be monitored very comfortably. Changes in rankings for a specific period (for example, yesterday or a week ago) are also very clearly presented. In order to check the ranking of a keyword continuously, you can either add the visible keywords in the RANKING PROFILER or add your own desired keywords under the button "ADD YOUR KEYWORDS" in RANKED KEYWORDS of the RANKING MONITOR. 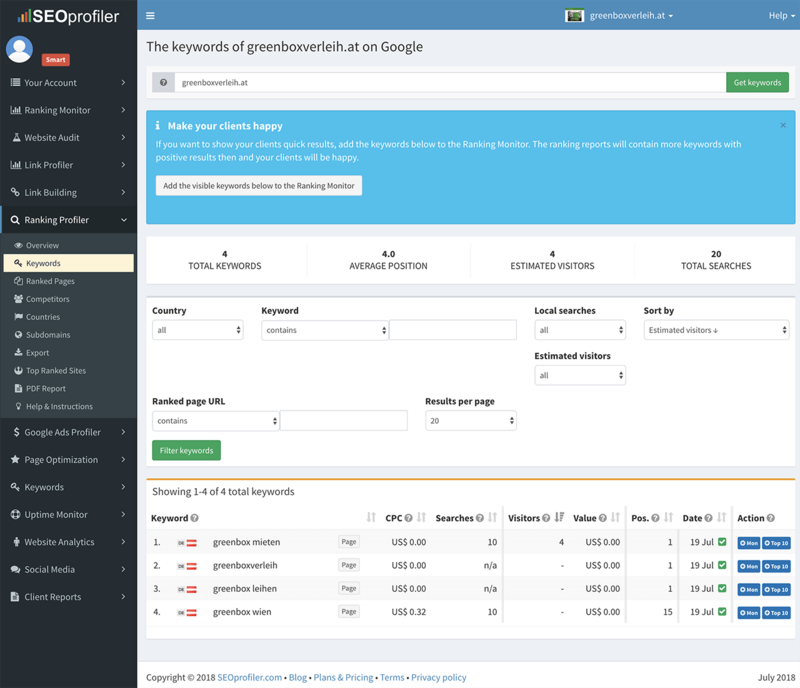 Optionally, you can specify a competitor for every keyword, which can be used to display its ranking next to your own. Based on this information, you can then repeat the page optimization to stay in the upper ranks of the search engine. 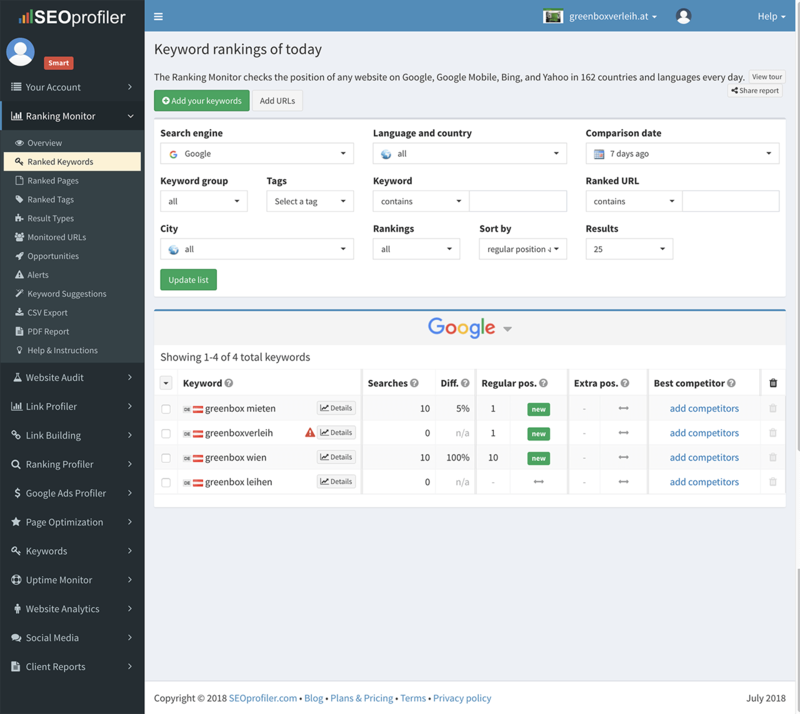 The main difference to the free version is the availability of daily updated keyword rankings. This feature can be tested in the 1 EUR for 1 month action very well. In the free version, you can also create a maximum of 2 projects, while in the smallest paid package - the SMART Edition - there are already 10 projects.